Although the big raptors like Eagles and falcons seem much more exciting and can more easily motivate people to protect them, the Rusty Blackbird lacks a press agent and gets little fanfare regarding its plight. But that should not lessen the fact that it is in serious trouble and can use our help .While it may be a challenge to get some people excited about a Blackbird, we all should be very concerned about the future of this fast disappearing species. The National Audubon Society lists the Rusty Blackbird on its “Yellow” alert status category on the “Watch list,” which means a species that is either declining or rare. These typically are species of national conservation concern. Rusty Blackbirds numbers have been on the decline for more than 40 years, from an estimated 13 million in 1965 to 2 million in 2004, a more than 10 percent decrease each year with no end in sight. And maybe just as frightening is that the reasons for their declines are not fully understood. 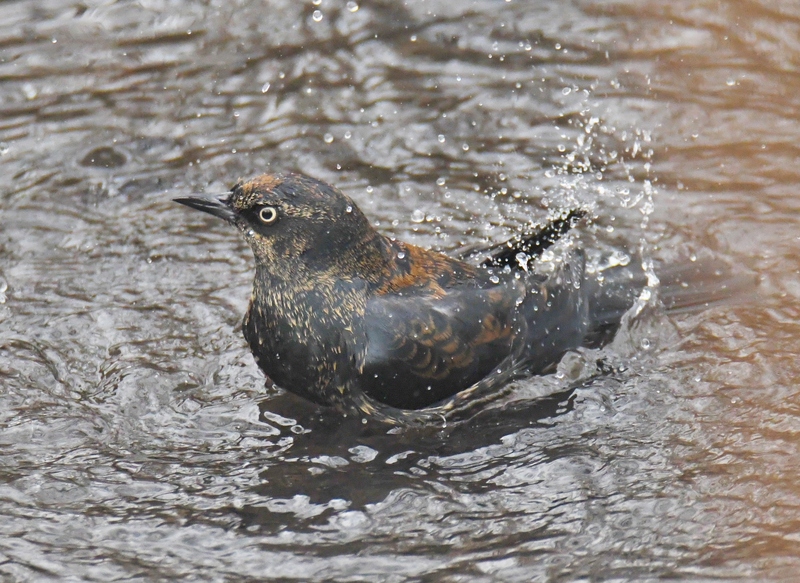 Exactly how to help the Rusty Blackbird is complicated, and the experts are not sure where to start. Scientists blame the dramatic decline of Rusty Blackbirds on aic rain, mercury accumulation on breeding grounds, changes associated with global warming as their breeding ground in the boreal forests in the north continues to dry, and the decline of the beaver and beaver ponds which they depend on for nesting and foraging habitat. Closer to home the destruction and fragmentation of lowland /wetland forests seriously diminishes their wintering grounds. Rusty Blackbirds, which can be seen in our area from late fall through April, can be easily confused with Grackles or even Red-winged Blackbirds. So keeping a close eye on the field marks is important for a positive ID. In winter, male Rusty Blackbirds are recognized by their rusty feather edges, pale yellow eye and buffy eyebrow. Females are gray-brown. They also have rusty feather edges, pale eyes and a bold eyebrow, contrasting with darker feathers right around the eye. Breeding males are dark glossy black. And as it always does for any species in decline much comes down to habitat loss . The Rusty Blackbirds’ wintering habitat is also vanishing and that is why preserving wooded wetlands in our area becomes so important to helping these birds hang on and survive. 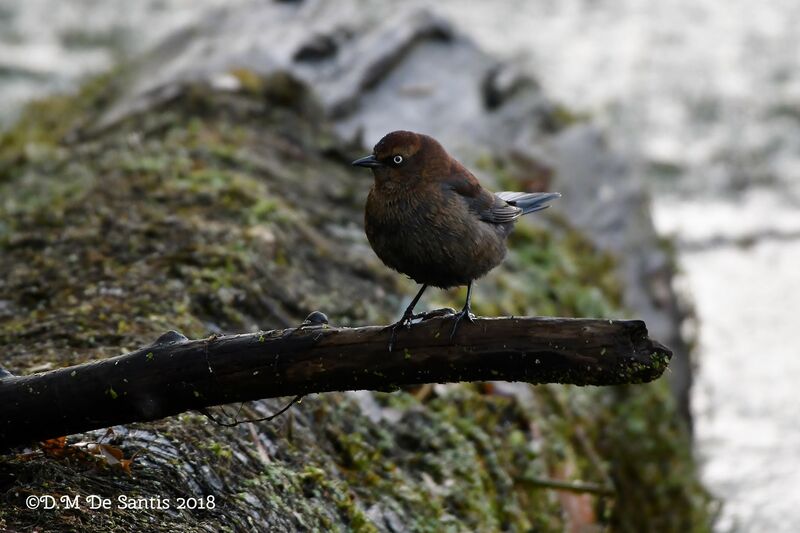 Rusty Blackbirds prefer bogs, ponds, swamps, and slow streams, and seek out wet areas to feed at the water’s edge for invertebrates and tiny fish, sometimes even wading in the water as they hunt throughout their migration route. In winter, they forage in swamps and wet woodlands and can also visit your backyard bird feeder as many bird feeder reports come in as the wild food disappears. Although wooded wetlands are disappearing in our area don’t disregard looking for them in a local patch of woods near your home as they try to survive this very tough winter. In the Meadowlands, Losen Slote Creek in Little Ferry is still a good place to find Rusties. Close by the Teaneck Creek Conservancy is also a winter stronghold for these wonderful birds. 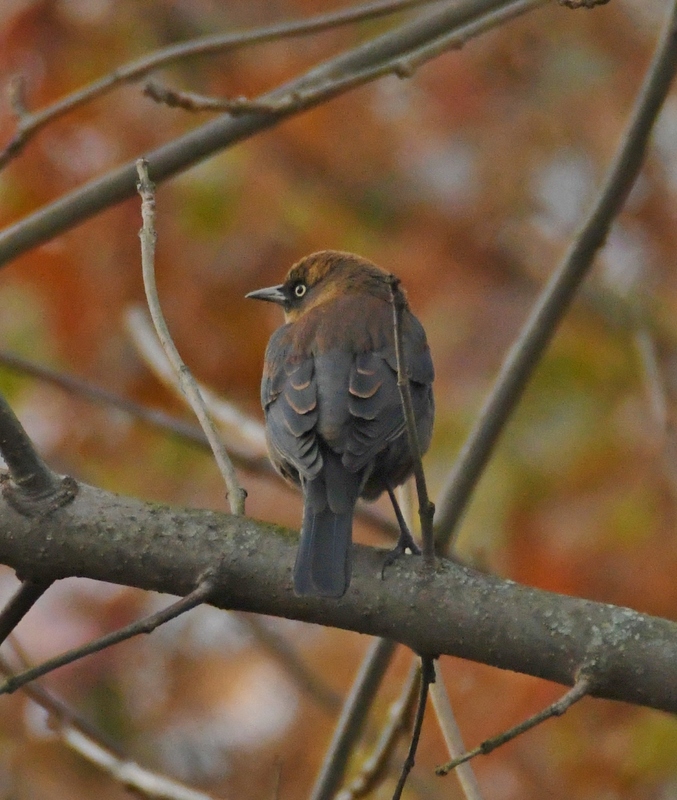 We all need to join together to be sure birds like the Rusty Blackbird have a future for future generations to come. Thank you to Jim Macaluso and Dee De Santis for providing the great photos for this column!